Posted on Dec.29, 2013 by Barry Bookmark the Permalink. The sound, durability and convenience of our world-renowned space and cartage saving nesting drum kit is ideal for the rigors of the road as well school settings. 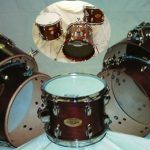 Drummers World Custom Nesting Drum Kits are meticulously constructed by hand, one at a time, and tested for quality of construction and sound prior to shipment. Their warm, full and resonant tone makes them comfortable to play in any style of music. The friendly yet rugged transportation and storage system where each drum fits inside the next larger one, allows them to be carried in a single case and yet set up just like a conventional drum set. The proven durability of our custom nesting drum kit makes it well suited for travel, especially doing one nighters. 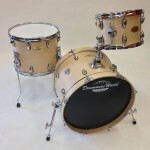 This same durability makes this drum set great for school and university applications as well. Many of our customers are world-class artists who enjoy the portability, convenience and sound of the Drummers World custom nesting drum kit. 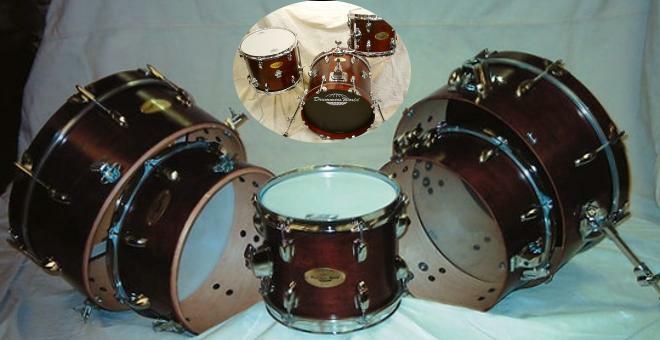 We have been manufacturing these drums since the 1990s. They are rated number one internationally. 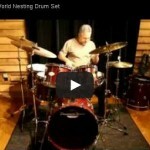 Drummers World Custom Nesting Drum Kits in Action! Rick Dior demonstrates his two Drummers World Custom Nesting Drum Kits purchased December 2013. 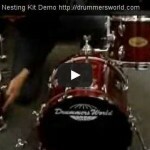 Demo showing how to break down our Drummers World Custom Nesting Drum Kit. 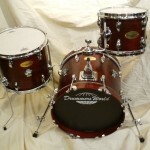 Demo of the Drummers World Custom Nesting Drum Kit’s sound. 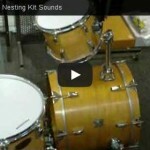 I have one of your 2011/2012 16″ Nesting kit and love it. Glad to hear your satisfaction with the Mini- Nesting Kit. 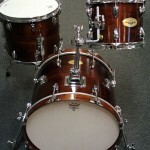 Presently we are using maple only and have no plans to use mahogany shells or combinations of mixed woods in the kits. However, if there is a demand, we will surely incorporate the idea. 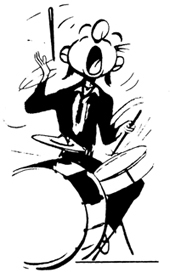 Given that the drums are custom made by hand., what is the expected lead time for delivery? I have a gig May 18th. Is that too tight? Leon, our normal delivery time for Nesting Kits is 6 weeks from when the order is placed. Please provide some info about the weights of these kits when packed. The kits’ weights vary according to size. The 20″ packed is approx. 32 lbs. The 18″ is 30 lbs. and the 16″ 28 lbs. Hope this helps. Hi there, Im interested in your 18″ nesting kit set. May i know the thickness of the shell? thank you. Thank you for your interest. Our shells are 8-ply maple. The thickness is .21 inch which is 5.4mm. Hope this answers your question.